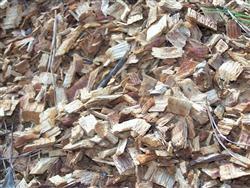 We have grade B mulch that we can deliver to your property when we are in your area. This mulch comes from the chippings from several kinds of trees. The loads are approximately 9 cubic yards. Our trucks are large and we need plenty of overhead clearance for raising the dump bed. It works great for mulching beds and trees. Note: Due to truck weight, we cannot warrant any driveway, sidewalk or other surface against cracks or breaks.